November | 2011 | Brainder. Even though we are at the end of 2011, with many powerful Linux distributions available and even with Windows 8 on the horizon, someone decided that this otherwise excellent machine should instead run on the obsolete Windows XP. Due to policy issues, and not hardware or software limitations, it is not possible to partition the internal hard disk and install any other operating system for dual boot. The rationale stems from a single policy for all the departments. There is no limitation on storing data, but there are also limitations on installing software to run in Windows. VirtualBox is explicitly blocked, as well as a number of other important applications. A possible alternative to this hideous scenario could be run a Live CD of any recent Linux distribution. However, storing data between sessions in these live systems is complicated. Even more is to install additional software as needed. Another possibility would be run the OS from an external drive. This works perfectly. However, for a laptop, to keep carrying the external disk all the time is cumbersome. Moreover, the disk takes a couple of seconds to be enabled again after a sleep or hibernation, so the system may not resume properly when trying to wake up. A solution is as follows: create a large file in the NTFS partition, install Linux inside this file, and boot the system from an USB flash drive. To discourage curiosity, the file can be encrypted. This article describes the steps to accomplish this task using openSUSE, but a similar strategy should work with any recent distribution. A computer with an NTFS partition, inside which you want to have Linux, without tampering with the actual Windows installation. openSUSE installation DVD (tested with 12.1, and should work with other recent versions). Similar steps may work with other distributions. 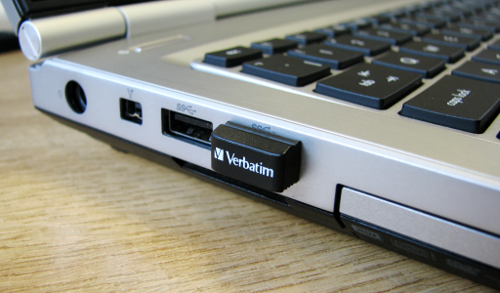 A USB flash drive which will be used to boot the Linux system and will also store the kernel. This flash drive must stay connected during all the time in which the system is on, therefore it is more convenient if it is physically small. See a picture below. An external USB hard disk, to be used for a temporary installation that will be transferred to the file in the NTFS partition. Step 1: Plug the external hard disk and install openSUSE in it. Choose the desktop environment that suits you better (e.g. KDE/GNOME or other). It’s advisable to make this choice now, as it will save you time and effort, instead of leaving to add the graphical mode later. Leave /boot on its own partition as it will also facilitate steps later. Do not create a swap partition for this installation (ignore warnings that may appear because of this). Let’s call this as the system “E”, as it will reside temporarily on the External disk. During the installation, install GRUB to the external disk itself, not to the internal drive (i.e., not /dev/sda), as you don’t want to tamper with the structure of internal hard drive or with the way as Windows boots. Before restarting the new system, if you changed the partitioning of the external disk, make sure that the partition that contains /boot has the “bootable” flag active (use fdisk to fix if needed). Step 2: Make another install of openSUSE, this time to the flash drive. Again, put /boot on its own partition. Be generous with /boot, as it will accommodate 2 ramdisks and perhaps 2 or more kernels. Use at least 100MB. This installation can (and should) be the minimal, with no X (text-only). Let’s call this as system “F”, as it will reside in the USB Flash drive. 1st partition: 14GB, FAT or similar, to use as a general USB drive, nothing special. 2nd partition: 1.8GB, ext4, to be mounted as as /, and where the system will reside. 3rd partition: 0.2GB, ext4, to be mounted as /boot. Like in the installation to the external hard disk, do not install GRUB to the internal drive, but to the USB memory stick. For the list of software, install the ntfs-3g, ntfsprogs and cryptsetup. Install the man pages as well, as they may be useful. Before booting the system F, make sure that the partition that contains /boot is bootable (use fdisk to fix if needed). Note that in the command above, the password is not “SecretPassword”, but instead, the content of the file key.txt, as produced by the command sha1sum. This includes the space and dash (-) that are inside, as well as a newline character (invisible) at the end. Do not store the keyfile in the NTFS partition. Put it, e.g., in the /root directory of the flash drive. This will take several hours. You may want to leave it running overnight. A message that any data on the device will irrevocably be deleted is shown. In this case, the device is the file full of random bits that we just created. So, confirm by typing ‘YES’ in capital letters. This will create a /dev/mapper/root device, which is an unencrypted view of the content of the big file previously created. The /dev/loop0 is an encrypted view and is not meaningful for reading/writing. The block size will be 1024. Smaller sizes will mean more free disk space for a given amount of stored data. c) Run mkinitrd to create a new ramdisk. The newly generated initrd will load the system that will be left in the flash drive, now with support for USB 3.0, and won’t be changed from now on. INITRD_MODULES="xhci-hcd fuse loop dm-crypt aes cbc sha256"
Again, the xhci-hcd module is to allow booting the system from an USB 3.0 port (even if the flash drive is 2.0). If you don’t have USB 3.0 ports, this module can be omitted. The other modules are necessary to mount the NTFS partition, to mount files as a loopback devices, and to allow encryption/decryption using the respective algorithms and standards. b) Run mkinitrd to create a new ramdisk. c) Make a copy of the newly created initrd to a place where it can be edited. f) Copy also all the required libraries for these executables that may be missing (use ldd to discover which). There is certainly a way to script this, but to prepare and test the script will take as much time as to copy them manually. This has to be done just once. 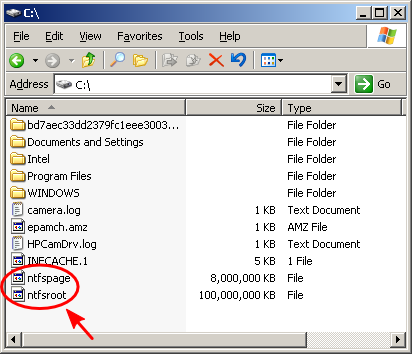 b) Execute the first, so that the file in the NTFS partition is mounted at /mnt/ntfsroot. After this point, the external hard drive is no longer necessary. It can be unmounted and put aside. The only difference between the first and second entries is the initrd. In the first, the initrd will load the system that is inside the file in the NTFS partition, and which will contain the full graphical system. In the second, the initrd will load the simpler, text-only install on the USB flash drive. We installed a modern, cutting edge Linux distribution inside a regular file in an NTFS partition. We did not modify any of the settings of Windows XP, neither did we partition the internal hard disk, nor tampered with the Windows registry or did anything that would violate any company rule. The boot loader, the kernel, and the initrd were left in an external device, the USB flash drive. When seen from Windows, only two inoffensive and unsuspicious files appear in the C:\. They contain the quiescent power of Linux.